We print below On Authority by Friedrich Engels, written between October 1872 and March 1873 and published first in Italy in December 1873. In refuting arguments raised by anarchists and echoed by some socialists, Engels pointed to the experience of the Paris Commune of March-May 1871, when the proletariat briefly governed the city before being crushed by the French army with the support of German forces, with over 20,000 slaughtered. Karl Marx and Friedrich Engels, the founders of scientific socialism, described the Paris Commune as the first historical expression of the dictatorship of the proletariat—i.e., a workers state. Engels polemic has resonance in todays ideological climate, which is overwhelmingly conditioned by the counterrevolutionary destruction of the Soviet Union in 1991-92. The bourgeois rulers lying proclamation of the death of communism has provided fertile ground for the re-emergence of anarchist and other retrograde political tendencies. The following translation is taken from the Collected Works of Marx and Engels (International Publishers, 1988). A number of socialists have latterly launched a regular crusade against what they call the principle of authority. It is sufficient for them to say that this or that act is authoritarian for it to be condemned. This summary mode of procedure is being abused to such an extent that it has become necessary to look into the matter somewhat more closely. Authority, in the sense in which the word is used here, means: the imposition of the will of another upon ours; on the other hand, authority presupposes subordination. Now, since these two words sound bad and the relationship which they represent is disagreeable to the subordinated party, the question is to ascertain whether there is any way of dispensing with it, whether—given the conditions of present-day society—we could not create another social system, in which this authority would be given no scope any longer and would consequently have to disappear. On examining the economic, industrial and agricultural conditions which form the basis of present-day bourgeois society, we find that they tend more and more to replace isolated action by combined action of individuals. Modern industry with its big factories and mills, where hundreds of workers supervise complicated machines driven by steam, has superseded the small workshops of the separate producers; the carriages and wagons of the highways have been substituted by railway trains, just as the small schooners and sailing feluccas have been by steam-boats. Even agriculture falls increasingly under the dominion of the machine and of steam, which slowly but relentlessly put in the place of the small proprietors big capitalists, who with the aid of hired workers cultivate vast stretches of land. Everywhere combined action, the complication of processes dependent upon each other, displaces independent action by individuals. But whoever mentions combined action speaks of organisation; now, is it possible to have organisation without authority? Supposing a social revolution dethroned the capitalists, who now exercise their authority over the production and circulation of wealth. Supposing, to adopt entirely the point of view of the anti-authoritarians, that the land and the instruments of labour had become the collective property of the workers who use them. Will authority have disappeared or will it only have changed its form? Let us see. Let us take by way of example a cotton spinning mill. The cotton must pass through at least six successive operations before it is reduced to the state of thread, and these operations take place for the most part in different rooms. Furthermore, keeping the machines going requires an engineer to look after the steam engine, mechanics to make the current repairs, and many other labourers whose business it is to transfer the products from one room to another, and so forth. All these workers, men, women and children, are obliged to begin and finish their work at the hours fixed by the authority of the steam, which cares nothing for individual autonomy. The workers must, therefore, first come to an understanding on the hours of work; and these hours, once they are fixed, must be observed by all, without any exception. Thereafter particular questions arise in each room and at every moment concerning the mode of production, distribution of materials, etc., which must be settled at once on pain of seeing all production immediately stopped; whether they are settled by decision of a delegate placed at the head of each branch of labour or, if possible, by a majority vote, the will of the single individual will always have to subordinate itself, which means that questions are settled in an authoritarian way. The automatic machinery of the big factory is much more despotic than the small capitalists who employ workers ever have been. At least with regard to the hours of work one may write upon the portals of these factories: Lasciate ogni autonomia, voi che entrate! [Leave, ye that enter in, all autonomy behind!] If man, by dint of his knowledge and inventive genius, has subdued the forces of nature, the latter avenge themselves upon him by subjecting him, in so far as he employs them, to a veritable despotism independent of all social organisation. Wanting to abolish authority in large-scale industry is tantamount to wanting to abolish industry itself, to destroy the power loom in order to return to the spinning wheel. Let us take another example—the railway. Here, too, the co-operation of an infinite number of individuals is absolutely necessary, and this co-operation must be practised during precisely fixed hours so that no accidents may happen. Here, too, the first condition of the job is a dominant will that settles all subordinate questions, whether this will is represented by a single delegate or a committee charged with the execution of the resolutions of the majority of persons interested. In either case there is very pronounced authority. Moreover, what would happen to the first train dispatched if the authority of the railway employees over the Hon. passengers were abolished? But the necessity of authority, and of imperious authority at that, will nowhere be found more evident than on board a ship on the high seas. There, in time of danger, the lives of all depend on the instantaneous and absolute obedience of all to the will of one. When I submitted arguments like these to the most rabid anti-authoritarians the only answer they were able to give me was the following: Yes, thats true, but here it is not a case of authority which we confer on our delegates, but of a commission entrusted! These gentlemen think that when they have changed the names of things they have changed the things themselves. This is how these profound thinkers mock at the whole world. We have thus seen that, on the one hand, a certain authority, no matter how delegated, and, on the other hand, a certain subordination, are things which, independently of all social organisation, are imposed upon us together with the material conditions under which we produce and make products circulate. We have seen, besides, that the material conditions of production and circulation inevitably develop with large-scale industry and large-scale agriculture, and increasingly tend to enlarge the scope of this authority. Hence it is absurd to speak of the principle of authority as being absolutely evil, and of the principle of autonomy as being absolutely good. Authority and autonomy are relative things whose spheres vary with the various phases of the development of society. If the autonomists confined themselves to saying that the social organisation of the future would restrict authority solely to the limits within which the conditions of production render it inevitable, we could understand each other; but they are blind to all facts that make the thing necessary and they passionately fight the world. Why do the anti-authoritarians not confine themselves to crying out against political authority, the state? All socialists are agreed that the political state, and with it political authority, will disappear as a result of the coming social revolution, that is, that public functions will lose their political character and be transformed into the simple administrative functions of watching over the true interests of society. But the anti-authoritarians demand that the authoritarian political state be abolished at one stroke, even before the social conditions that gave birth to it have been destroyed. They demand that the first act of the social revolution shall be the abolition of authority. Have these gentlemen ever seen a revolution? A revolution is certainly the most authoritarian thing there is; it is the act whereby one part of the population imposes its will upon the other part by means of rifles, bayonets and cannon—authoritarian means, if such there be at all; and if the victorious party does not want to have fought in vain, it must maintain this rule by means of the terror which its arms inspire in the reactionaries. Would the Paris Commune have lasted a single day if it had not made use of this authority of the armed people against the bourgeois? Should we not, on the contrary, reproach it for not having used it freely enough? Therefore, either one of two things: either the anti-authoritarians dont know what they are talking about, in which case they are creating nothing but confusion; or they do know, and in that case they are betraying the movement of the proletariat. In either case they serve the reaction. 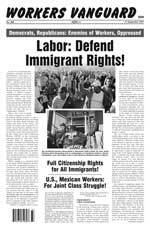 U.S., Mexican Workers: For Joint Class Struggle! Mumia Is Innocent! Free Him Now! Free Mumia Abu-Jamal! Free All Class-War Prisoners! Join the Spartacus Youth Club! Defend Bay Area ILWU Members!